Whenever I test something new, it tends to end up in my favorites. Well, if I like it that is. 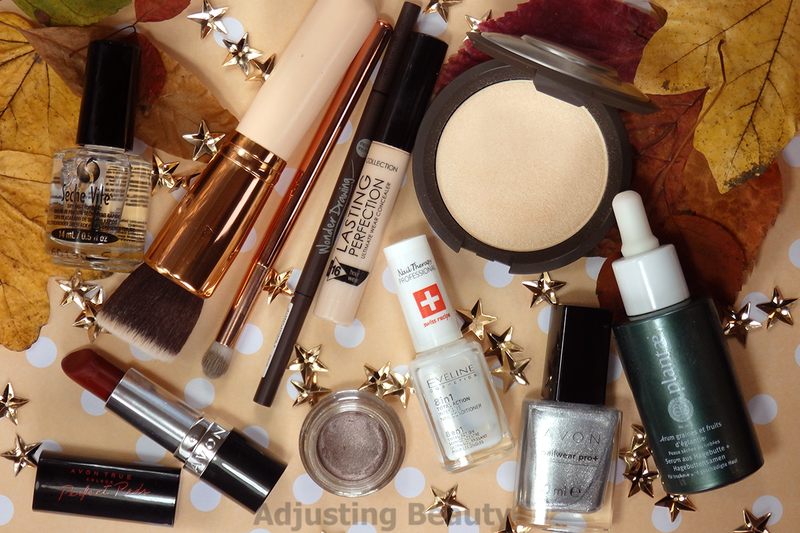 And this month I have some new favorites as well as some well loved products from before. 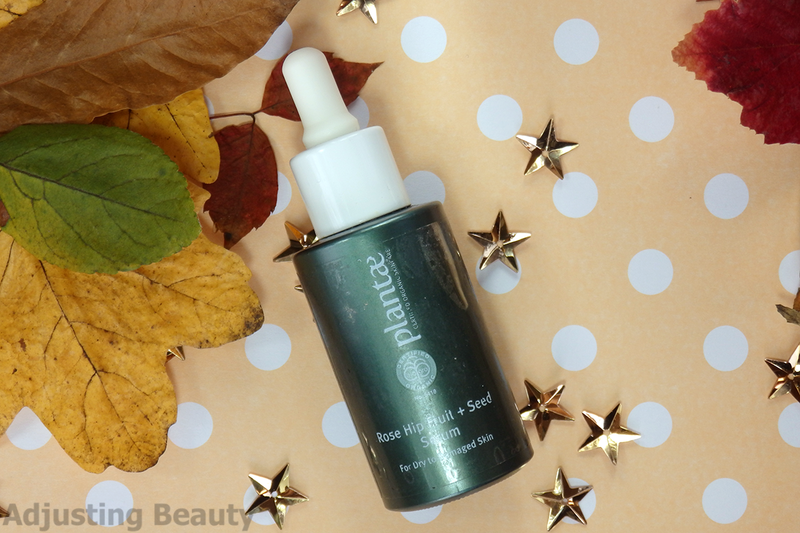 I use this serum, or rather oil, whenever I have skin problems like blemishes, dry skin around my lips or feel like I need a bit more moisture. Rose hip oil is perfect for my sensitive skin. I like how moisturized and plumped this makes my skin. The reason why I love it so much, is because it seems like this really reduces any scarring from blemishes. 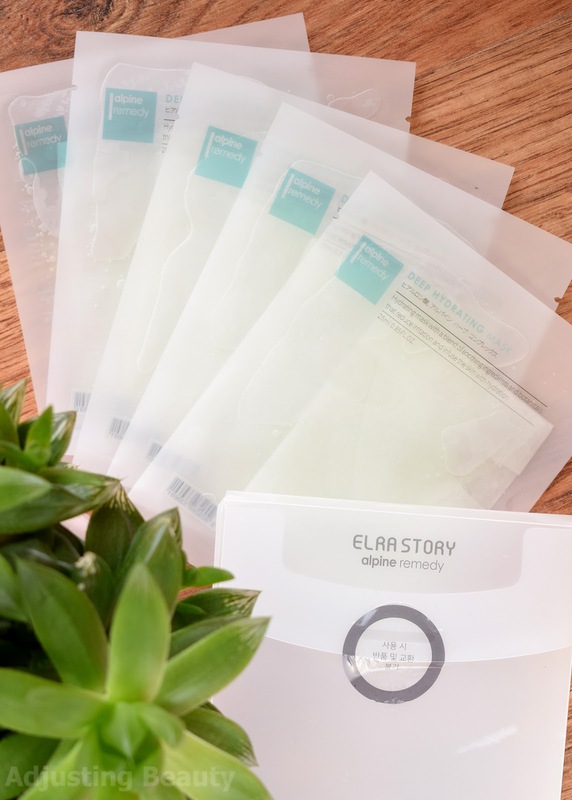 It's just a lovely products for dry and damaged skin. I use it sparingly, because it's not the most cheap product, but it definitely works. A while ago I bought a whole rose gold set of makeup brushes on Ebay. I haven't found many uses for other brushes and in all honesty I didn't like scratchy bristles at all. But this flat foundation brush is great. It has really soft synthetic brushes that are pretty dense. 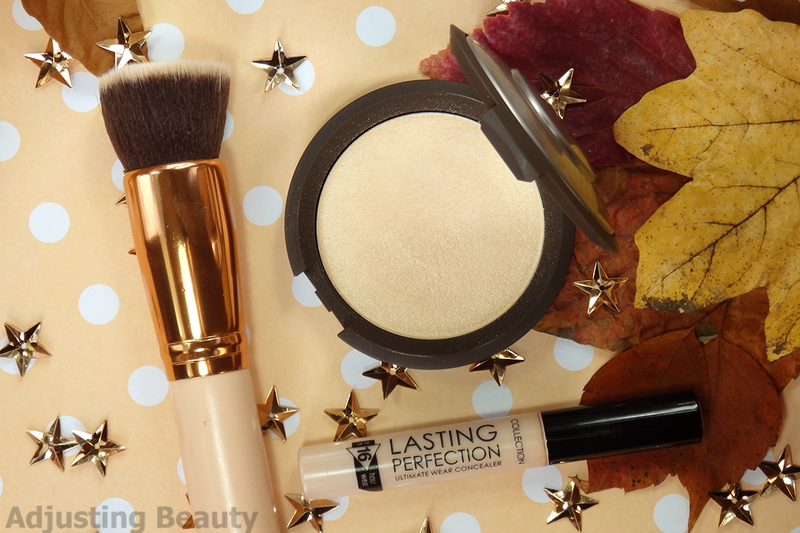 It's great for buffing in foundation. I also love to tap it around my skin, because it almost pushes foundation in and it doesn't leave stripes all over your skin. It helps that it looks pretty. I've been a bit avoiding makeup sponges, because I am really bad at cleaning them. This is a lovely concealer. I love that it's quite thick and seems to have a good coverage. It dries a bit fast which means that is really easy to build up. The shade is too pink for my liking. I prefer a bit more yellow toned shades. I absolutely despise the packaging. It spills the product every time your screw on the top. It drives me crazy. Wherever I put it, it leaves a stain. Compared to my favorite Catrice Liquid Camouflage High Coverage Concealer this one is a bit more buildable and it dries to a more matte finish so you almost don't need to set it. I'm still deciding which one I like better. I think I made a good choice finally purchasing it. It's one of the most effortless looking, yet still shiny and visible highlighters. It looks quite natural and you can apply it with not much effort in mind and it just looks great. Shade Moonstone is lighter than my favorite theBalm Mary-Lou Manizer and is perfect for fair skin tones. 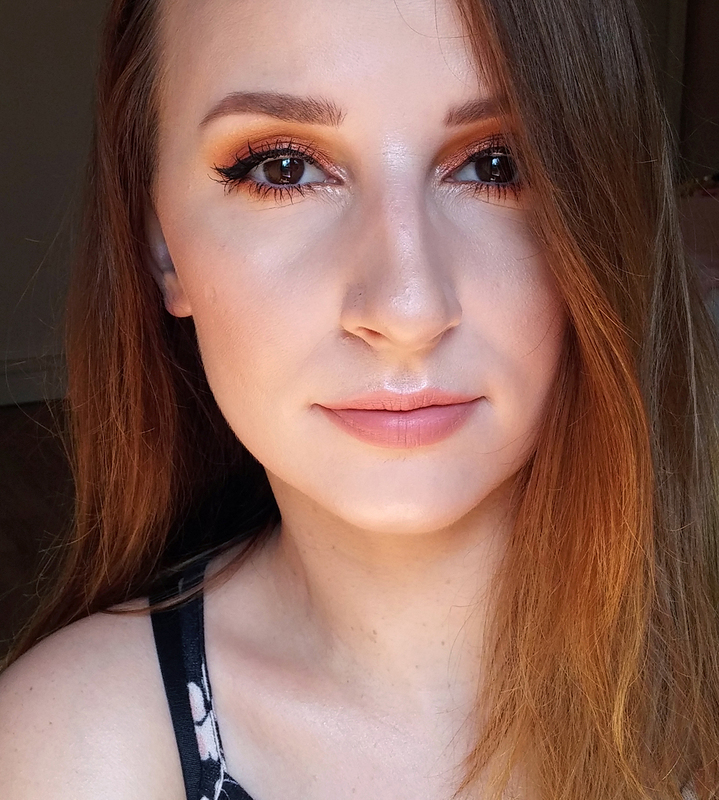 Mary-Lou Manizer can look a bit too yellow and dark if I layer it, especially when I'm at my palest. Moonstone is perfect for colder months. I've been testing a few of new Avon products and these cream eyeshadows have seriously impressed me. Texture depends from shade to shade. Here I photographed Bronzed Gold which is the most creamy of them all. Some are really hard in texture and you need a dense brush to pick them up, but these last like crazy. I wore them the whole day without any creasing. It dries on the skin like cement, but doesn't feel heavy. They are also waterproof. By far one of the most long lasting cream eyeshadows that I've tried so far. 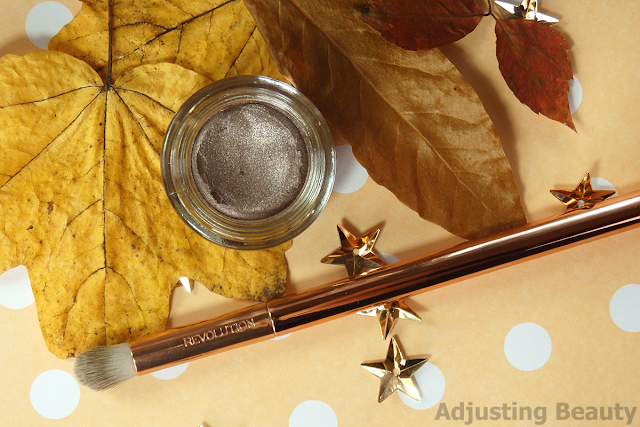 The brush that I've been applying those cream eyeshadows with is this one. I don't actually have a review of it, but Mateja has. I like that it's fairy soft, small and dense. It makes it easy to pick up thick creamy products and because it's small enough, it still gives me enough precision. I also think that you can blend out the product well with it. 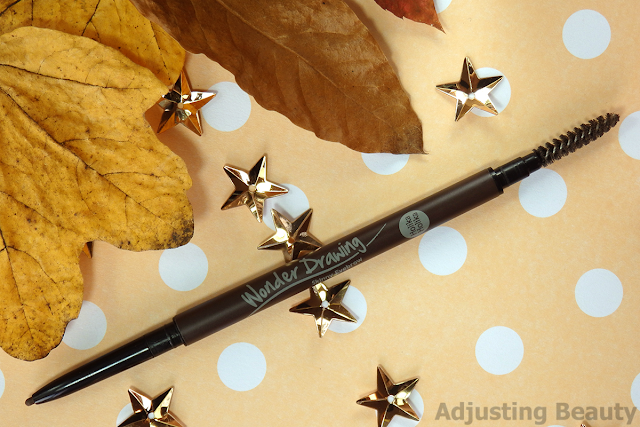 It's my new favorite brow pencil. On one side is super thin and small pen tip and on the other is a spoolie. I love how thin this is and the fact that you can create hair like strokes. It's also just hard enough that it doesn't apply too much color, but you can always build it up. Shade 02 is a warmer medium brown. It goes with my hair color well. I also like that it stays on my brows for the whole day. 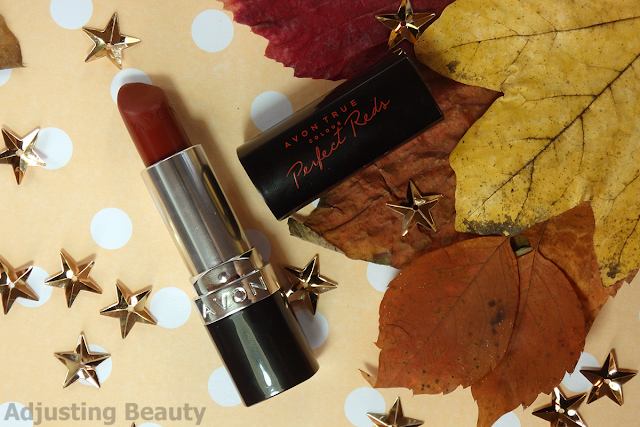 The lipstick that has been my favorite this month is Perfect Red by Avon. I love how comfortable and moisturizing formula feels on the lips. Shade Perfect Red is my favorite, because it has a bit of a brown undertone to it and it's not too dark nor too light. It feels like a perfect fall red shade. Sometimes I use it as a full on lip color and sometimes I just use it as a stain. It's just as comfortable as a colored lip balm which is a total win for my dry lips. I wouldn't even know about this product, if my friend wouldn't mentioned it to me. She said that she's been using it for a while and it made her nails really long and strong. I was a bi hesitant buying it, because my friend always had lovely nails. In the end, I caved in, because I am always on a hunt for that product that will actually help my brittle, soft and weak nails. It actually worked. For a couple of weeks I applied just that and after that I only used it as a base nail polish. It's been years since I've had such long nails as I do know. It also seems like my nails don't chip as much as they did before. Here and there I can still find some top layer of nail poking out, but all in all they look better and they are definitely longer. It does contain formaldehid for those of you that want to know what you put on the nails. 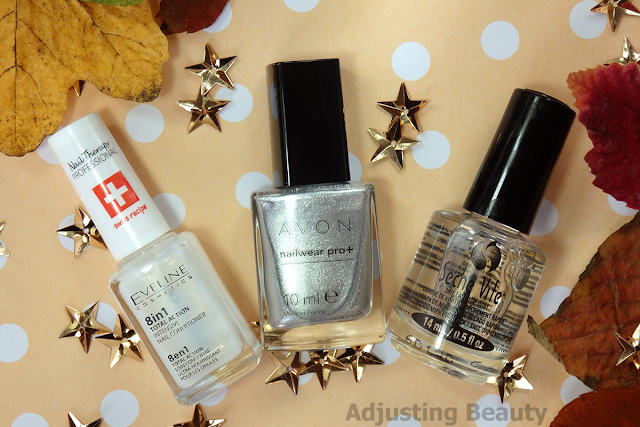 Out of all metallic nail polishes from their new range, I've surprisingly liked most White Gold. It's essentially light silver color which I don't like at all. But the reason I like this one so much is because it almost looks like a mirrored effect from afar. It has tiny shimmer which makes it super shiny and it's definitely not like a proper mirrored effect, but it seems pretty similar. It's super shiny and everyone seems to like the effect. I don't want to be separated from it ever again. You're simply the best, better than all the rest...as Tina Turner would say. Nothing compares to it. It dries fast, doesn't smudge nail design, gives lovely shine to the nails and is simply the most long lasting of them all. I am so happy to finally have a new bottle. Jaz imam zdaj res po nekaj letih končno spet dolge nohte. I'm so happy :D. Zdaj se več ne ločim. Upam, da bo še naprej deloval. Moonstone is a must, za nas svetlopolte vsaj. ;) Meni drugi čopiči niso bili nobeni všeč. Ta pa mi je res super. Ga kar vsak dan uporabljam in je ravno dovolj gost za nanašanje podlage. Res je odličen :). Se strinjam. Pričakovani favouriti, sploh ker te redno prebiram :) Jaz sem pa pri čopičih čisto v teh oval brushes - neverjetno dobri za puder, ampak za ostalo pa ne. Te Avonova senčila sem videla na Stories, izgledajo odlična :) So boljša od Kikovih? Čeprav jaz imam raje da so v palčki. Zdaj malo obžalujem da nisem vseeno vzela zase en Collection na rezervo, čeprav bom še vedno preizkusila od Catrice, itak sta zihr oba zelo dobra, samo pri nas je zmeraj prazno stojalo. Jaz pa se kar ne morem odločiti, da bi si kakšnega kupila. Se mi zdijo hecni :). Senčila so res super obstojna. Meni se vsekakor zdijo bolj obstojna kot Kiko. Mislim, da je za to ključna tekstura, ker ni tako zelo mazljiva. Res ves dan so na očeh in se čisto nič ne premikajo. Če bi bila v obliki svinčnikov bi bilo pa itak winner. Pri nas je tudi vedno razprodan ta korektor. Sploh pa najsvetlejši odtenek. Mi je čudno zakaj ga v DM-u nimamo. Tam sta samo dva odtenka. Jaz sem kupila prav tega, ker mi je bil ta priporočen. Zdaj vidim, da ima ob strani tudi neke oznake, da je dobil nagrade. Mogoče probaj še tega, če ti ni žal denarja. Meni res nič do zdaj ni pomagalo, pa sem že tudi preizkusila nekaj teh tretmajev. Voda jih pa itak uničuje. Moji so samo še bolj mehki :/.